Today I’ve got one question for you and one huge cleaning tip. The question is this: “What is the best way to clean out grout?” It’s the Holy Grail of cleaning questions, right? Or at least it seems to be the case. One of my awesome fans, Ashley Self, submitted this great cleaning tip, and it has to do with this little invention she likes to call the Grout Grime Buster 3000. And today, I am going to show you how to build this little fellow for less than $5.00. It’s going to make cleaning, not only your grout, but your kitchen and your bathroom and your laundry room, you name it, so much easier, quicker, and better. So let’s get started. In order to make the Grout Grime Buster 3000, you need a few things. You need some soap dispensing palm brush refills like this. I bough this at Target for a few bucks. You need a like this one. This is five inches long. You need a hex nut, a flat washer and two split washers. It’s pretty simply what you need to do. You need to put one of the split lock washers on the bolt and slide it through like so. The next step is to place a flat washer on the bolt and the second split lock washer. Slide your hex nut on there, get it snug. Use a crescent wrench and then a socket wrench to ratchet it down. And that’s all you need to do to make the Grout Grime Buster 3000. You can stick it into your drill like so. Lock it in place. 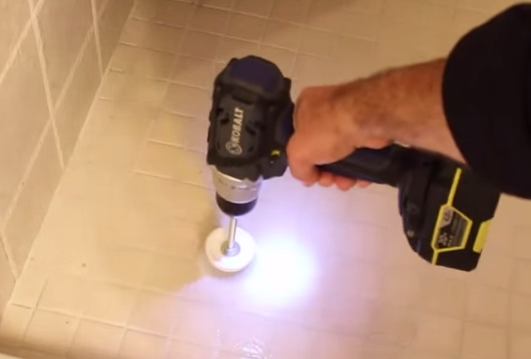 And now you’ve got the perfect grout or tile cleaning solution. In a previous experiment, I determined that one quarter cup of Oxi Clean added to two cups of warm water is the perfect tile and grout cleaning solution. Pour this solution onto your grout and tile. Let it sit for 5-10 minutes, then use the Grout Grime Buster 3000 to remove all the grime and dirt. Check this out. This is what Ashley’s grout and tiles looked like before and after. And this is what my tile and grout looked like before and after I used the cleaning solution and the Grout Grime Buster 3000. Pretty impressive, right? But this is not the only place that you can use this awesome little device. You can use it in your kitchen. You can use it in your laundry room. You can use it in your shower. You can use it for the tile in your shower. You can use it on your toilet. You can use it in your sink and many other places. It’s unbelievable! I’m here to tell you that this… I don’t know why nobody came up with this before for such a cheap price. So you should totally check this out. Build Grout Grime Buster 300. And if you have your own cleaning idea, let me know because maybe I’ll make a video out of it too. What do you think? Wasn’t that one of the best ways to clean grout? I think it was. If you have your own suggestion, please leave it in the comment section below because other DIY-ers or home repair tutors like myself will be able to share it with many home owners. And I think that it would benefit so many people. So please, leave you suggestion in the comment section below.